It was sunny when we left the Wave Crest Inn in the morning. We went through the tunnel again, but with less traffic this time so it seemed easier. We ate lunch at the Rising Star Café in Wheeler, OR This was by far the best meal of our whole trip! We had this amazing Cascade Potato Cheese soup and a delightful fish sandwich. We also got to play with the owner’s dog, Iggy (named after Iggy Pop). Mike “the German” called Kristen to warn us of a particularly bad pothole on the way into Tillamook. It rained on and off all day and then poured through the night. 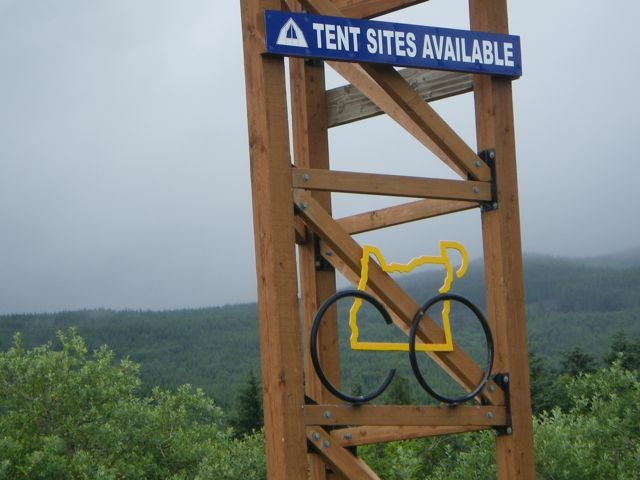 This RV park caters to the touring cyclist. Note clouds and rain.